Can we stop electric cars from playing music for safety? I struck a nerve several years ago when I blogged about the horrible beep-beep noise made by heavy equipment when it backs up. Eventually a British company came up with a solution: a pulsed burst of white noise which is very evident when you are near the backing up vehicle but which disperses quickly so it doesn't travel and annoy people a mile away as the beeps do. Read more about Can we stop electric cars from playing music for safety? A proposal is being floated in Europe for computerized convoys or road trains within the next decade. This is a proposal for a system where cars can hand over control to a lead car and follow in a train or convoy, without physical connection. First: I will be speaking on robocars tomorrow, Tuesday Nov 9, at 6:30 pm for the meeting of the Jewish High Tech Community in Silicon Valley. The talk is at 6:30pm at the conference center of Fenwick and West at Castro & California in Mountain View. The public is welcome to attend, there is a $10 fee for non-members. While giving a talk on robocars to a Stanford class on automative innovation on Wednesday, I outlined the growing problem of software recalls and how they might effect cars. If a company discovers a safety problem in a car's software, it may be advised by its lawyers to shut down or cripple the cars by remote command until a fix is available. Sebastian Thrun, who had invited me to address this class, felt this could be dealt with through the ability to remotely patch the software. Saturday saw the dedication of a new autonomous vehicle research center at Stanford, sponsored by Volkswagen. VW provided the hardware for Stanley and Junior, which came 1st and 2nd in the 2nd and 3rd Darpa Grand Challenges, and Junior was on display at the event, driving through the parking lot and along the Stanford streets, then parking itself to a cheering crowd. Junior continues to be a testing platform with its nice array of sensors and computers, though the driving it did on Saturday was largely done with the Velodyne LIDAR that spins on top of it, and an internal map of the geometry of the streets at Stanford. New and interesting was a demonstration of the "Valet Parking" mode of a new test vehicle, for now just called Junior 3. What's interesting about J3 is that it is almost entirely stock. All that is added are two lower-cost LIDAR sensors on the rear fenders. It also has a camera at the rear-view mirror (which is stock in cars with night-assist mode) and a few radar sensors used in the fixed-distance cruise control system. J3 is otherwise a Passat. Well, the trunk is filled with computers, but there is no reason what it does could not be done with a hidden embedded computer. What it does is valet park itself. This is an earlier than expected implementation of one of the steps I outlined in the roadmap to Robocars as robo-valet parking. J3 relies on the fact the "valet" lot is empty of everything but cars and pillars. Its sensors are not good enough to deal well with random civilians, so this technology would only work in an enclosed lot where only employees enter the lot if needed. To use it, the driver brings the car to an entrance marked by 4 spots on the ground the car can see. Then the driver leaves and the car takes over. In this case, it has a map of the garage in its computer, but it could also download that on arrival in a parking lot. Using the map, and just the odometer, it is able to cruise the lanes of the parking lot, looking for an empty spot, which it sees using the radar. (Big metal cars of course show clearly on the radar.) It then drives into the spot. This press release describes a European research project on various intelligent vehicle technologies which will take place next year. As I outline in the roadmap a number of pre-robocar technologies are making their way into regular cars, so they can be sold as safer and more convenient. This project will actively collect data to learn about and improve the systems. Tonight, at 111 Minna Gallery in San Francisco, we at EFF will be hosting a reading by Randall Monroe, creator of the popular nerd comic "xkcd." There is a regular ticket ($30) and a VIP reception ticket ($100) and just a few are still available. Payments are contributions to the EFF. In addition, the vehicle is designed to have the rear wheel on a lever arm so that it can stand almost upright when stopped and then slope down low, with the rider reclined, at higher speeds. The reclined position is necessary for decent drag numbers at speed -- the upright human creates a lot of the drag in a bicycle or motorcycle. However, the upright position when slow or stopped allows for much easier entry and exit of the vehicle. As everybody knows, really low cars are harder to get in and out of. Twill is not the first company to propose a vehicle which rises and lowers. For example the MIT CityCar plan proposes this so the vehicles can stack for parking. Even without stacking, such designs can park in a much smaller space. One of the questions raised by the numbers which show that U.S. transit does not compete well on energy-efficiency was how transit can fare so poorly. Our intuition, as well as what we are taught, makes us feel that a shared vehicle must be more efficient than a private vehicle. And indeed a well-shared vehicle certainly is better than a solo driver in one of todays oversized cars and light trucks. But this is a consequence of many factors, and surprisingly, shared transportation is not an inherent winner. Let's consider why. We have tended to build our transit on large, heavy vehicles. This is necessary to have large capacities at rush hour, and to use fewer drivers. But a transit system must serve the public at all times if it is to be effectively. If you ride the transit, you need to know you can get back, and at other than rush hour, without a hugely long wait. The right answer would be to use big vehicles at rush hour and small ones in the off-peak hours, but no transit agency is willing to pay for multiple sets of vehicles. The right answer is to use half-size vehicles twice as often, but again, no agency wants to pay for this or to double the number of drivers. It's not a cost-effective use of capital or the operating budget, they judge. 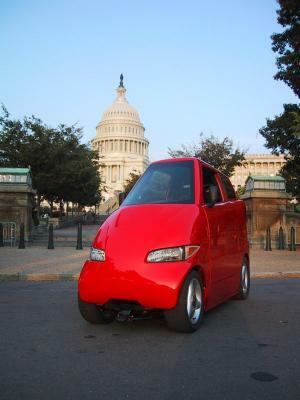 The urban vehicle of the future, as I predict it, is a small, one-person vehicle which resembles a modern electric tricycle with fiberglass shell. It will be fancier than that, with nicer seat, better suspension and other amenities, but chances are it only has to weigh very little. Quite possibly it will weigh less than the passenger -- 100 to 200lbs. Transit vehicles weigh a lot. A city bus comes in around 30,000 lbs. At its average load of 9 passengers, that's over 3,000lbs of bus per passenger. Even full-up with 60 people (standing room) it's 500lbs per passenger -- better than a modern car with its average of 1.5 people, but still much worse than the ultralight. Here's a short new robocar essay, on Robocars helping bring about flying cars. The thesis of the essay is simple. The quest for flying cars has always had to deal with the very difficult compromise between a vehicle that flies and one that drives. It's just really hard to make one vehicle to do both. Here's a nice story about the Kiva warehouse delivery robot now being used by major retailers like The Gap. Factory floor robots have been around for some time, and the field even has a name "automated vehicle guidance systems" but these newer deliverbots kick it up a notch, picking up shelves and bringing them to a central area for distribution, finding their way on their own with sensors. I've added a new concept to the notes section -- the Robo Snow Plow. In the article I describe the value of plows that can patrol the roads frequently without need for staff. Since you don't want to delay for recharging, these might be fuel-tank powered. I'll be giving a talk on Robocars on Friday, January 16th at the Bay Area Future Salon which is hosted at SAP, 3410 Hillview, Building D, Palo Alto CA. Follow the link for more details and RSVP information. Reception at 6, talks at 7. Eric Boyd will also talk on efficiency of transportation. I gave a few visits to the RoboDeveloper's conference the past few days. It was a modest sized affair, one of the early attempts to make a commercial robot development conference (it's been more common to be academic in the past.) The show floor was modest, with just 3 short aisles, and the program modest as well, but Robocars were an expanding theme. This week, as part of a 3-part series on the future of driving, ARS Technica has written a feature article derived from, and covering my series on Robocars. While it covers less than I do here, it does present it from a different perspective that you may find of interest. I've added a new Robocars article, this time expanding on ideas about how parking works in the world of robocars. The main conclusion is that parking ceases to be an issue, even in fairly parking sparse cities, because robocars can do so many things to increase, and balance capaacity. Readers of this blog will know I used to talk a bit about Personal Rapid Transit (PRT) but have switched to a belief that it is now likely that robocars might fulfill the PRT vision before actual PRT can. To understand that, it is necessary to explore just why PRT has never really come about, in spite of being promoted, and possible for almost 40 years. This special chapter in my series of essays on Robocars describes a fictional week in the Robocar world, with many created examples of how people might use Robocars and how their lives might change. If you haven't been following my essay on Robocars, this may be a good alternate entry to it. In a succinct way, it plays out many of the technologies I think are possible, more about the what than the how and why.